Down-to-earth. 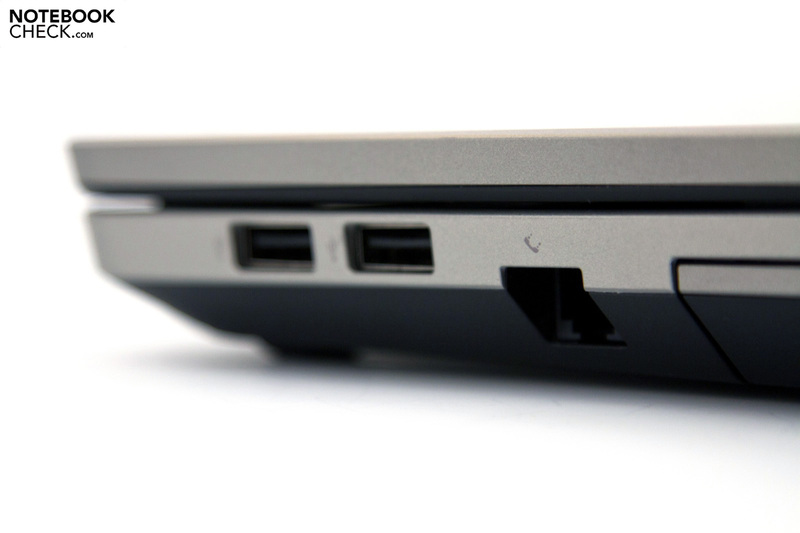 That's the best way to describe the new HP entry level business notebook. A new case design, solid construction, and up-to-date hardware, as well as a 15.6 inch display, are the most important prerequisites. 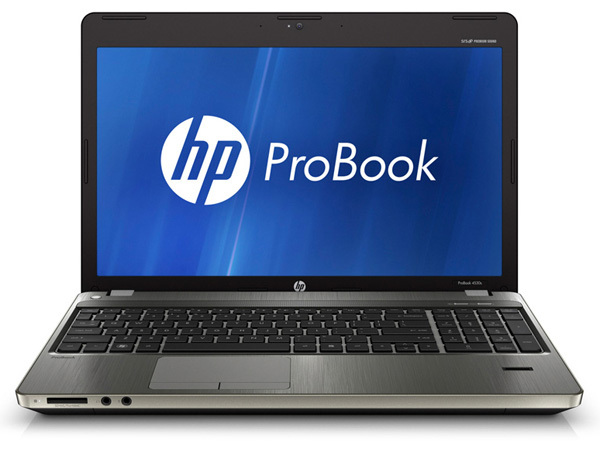 Is the HP ProBook 4530s with a price tag of around 700 Euros (RRP) also good value for money? 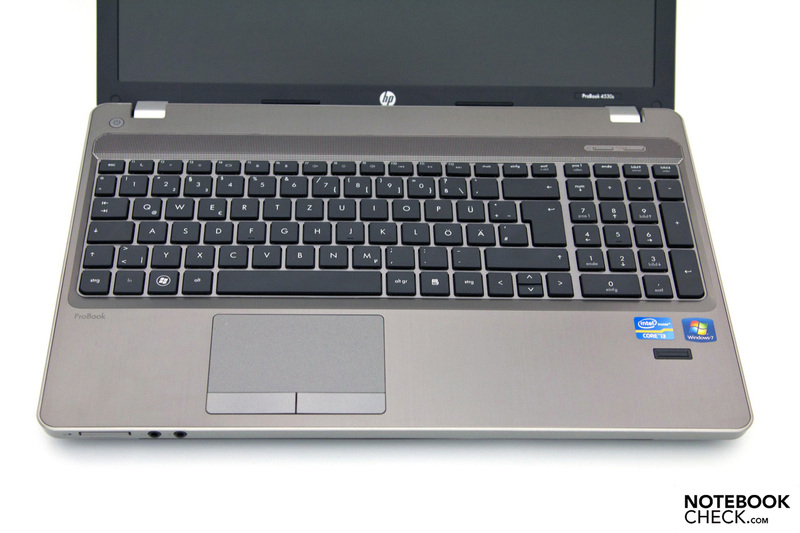 We were already able to take a closer look at the 2011 HP business series notebooks at a press event in March. Among these was also the HP ProBook 4530s with a matte 15.6 inch display (1366 x 768 pixels) and a new case design. Along with the dominant application of brushed aluminum surfaces, a simple choice of colors provides for a modern appearance. Compared to its predecessors all the surfaces have now been kept matte. 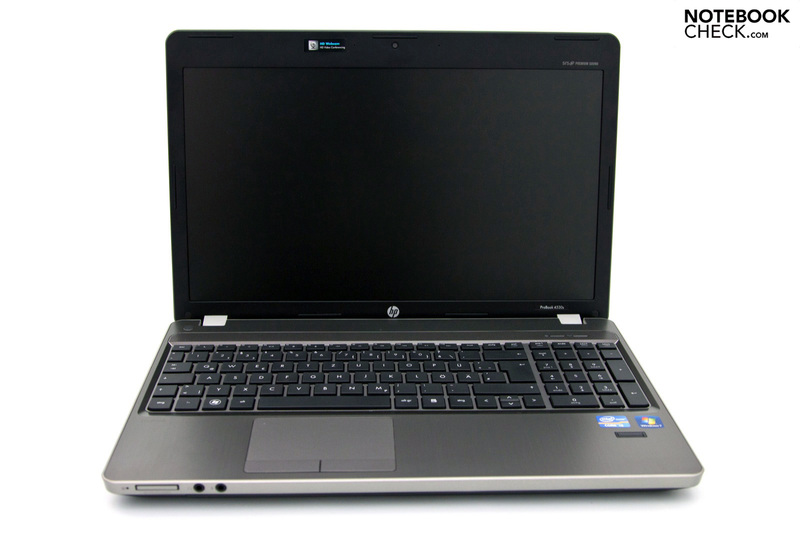 With an Intel Core i3-2310M (2.1 GHz), and an integrated Intel GMA HD 3000 graphics card, as well as a 320 GByte hard drive, and 4 GBytes of DDR3 RAM, we were able to test the new low cost HP ProBook 4530s-XX968EA model. 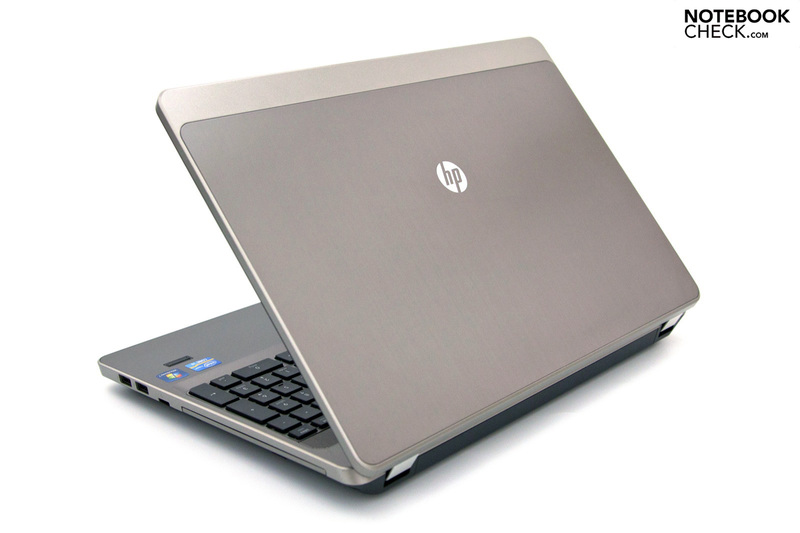 It is worth mentioning that HP is currently providing four models with different components. Along with different operating systems, there are also various Intel Sandy Bridge CPUs (maximum: Intel Core i7-2620M), a high resolution display, UMTS, and for example a Blu-ray burner available for selection. A glance at the HP model description shows that the 's' in the name stands for shorter platform cycles of between 9 and 12 months, and only provides a 12 months warranty from purchase. On the other hand the price range can be kept within a range of between 700 to 800 Euros. With Linux OS and a watered down configuration prices from 450 Euros are possible in the business class. The first impression counts! 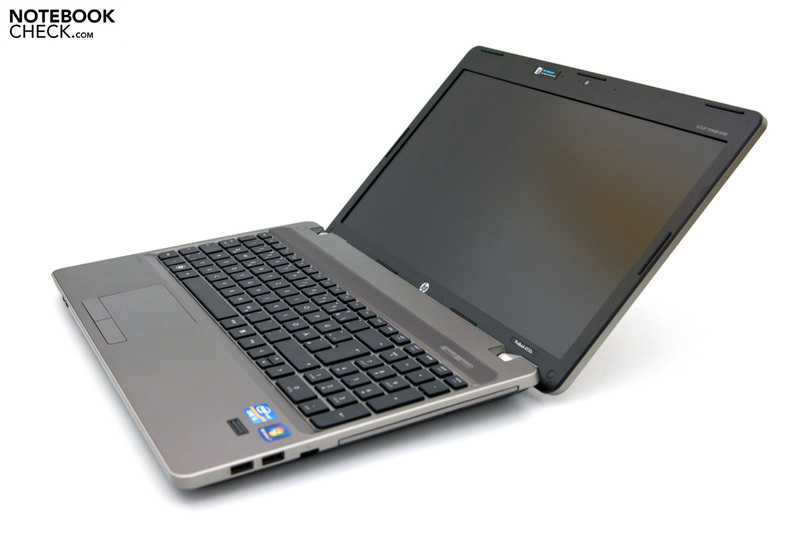 The HP ProBook 4530s is the first model with the new case being reviewed by us. The simple choice of colors, and the aluminum surfaces paired with a decent application of varnish, as well as the high quality feel, make a good impression straight away. HP themselves refer to a robust and long lasting design in their advertising. The addition of aluminum is not a miracle though, but fingerprints, dust, and scratches from daily use don't stand a chance. What is pleasing is the fact that the base behind the keyboard now also has a matte surface. With its predecessor this was also one of the areas of criticism, which didn't quite fit into the picture. The manufacturing quality leaves a solid impression, and we were also not able to find any shortcomings when looking in detail. On the other hand the case is primarily composed of simple plastic, which is not very robust in comparison. Business notebooks in the upper price segments are able to lift the standard with high quality metal alloys, and other qualitative materials. With respect to stability there are no grounds for criticism. Even localized pressure doesn't lead to any significant bending. 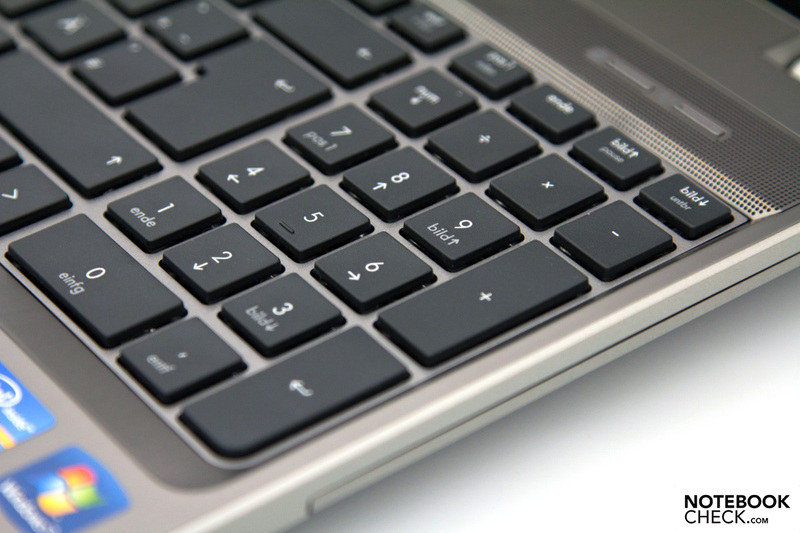 Merely the mesh grid above the keyboard is a bit soft, and dents quite easily. The display lid can be bent considerably, whereby the aluminum surface keeps this within limits, and thus prevents possible damage to the display. A positive aspect is the pressure resistance of the lid. The lid is held in place by two massive hinges, which hold the display firmly, and only wobble very little. What should be noted: Despite their appearance the hinges are not constructed completely out of metal. The plastic is merely covered by a panel. Also the bottom of the case has changed for the better. Via a large maintenance panel, which is held in place by two screws underneath the battery, more or less the whole of the inside area can be accessed. According to HP's website the maximum RAM that can be installed is 8 GBytes across two sockets. The 2.5 inch hard drive is located at the front, and changing this for a faster alternative could be completed quickly. The interfaces provided by the 4530s make a good impression. Along with the currently usual three USB 2.0 ports, and one HDMI and VGA output, there is also a ExpressCard 34 slot, as well as a USB 3.0 port available, which can be recognized by the description "Super Speed". Compared to its predecessor the current model doesn't have an eSATA combo-port, and thus has two interfaces less (eSATA and a further USB 3.0 port). In its place there is only one RJ-11 socket, which are very rare nowadays. 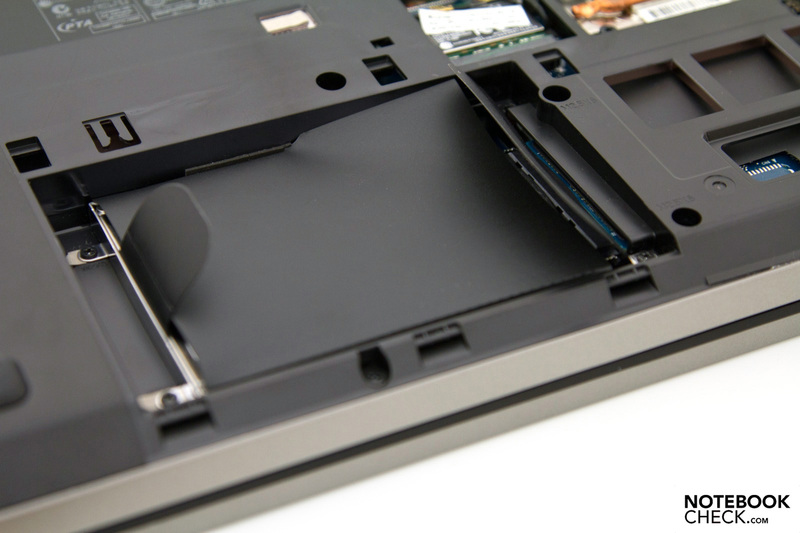 The distribution of the ports is unfortunately limited to the sides of the notebook, whereby there is a tendency for the interfaces to be located towards the front. Along with the quick build up of cables, there is also potential for a possible impediment for using a mouse. 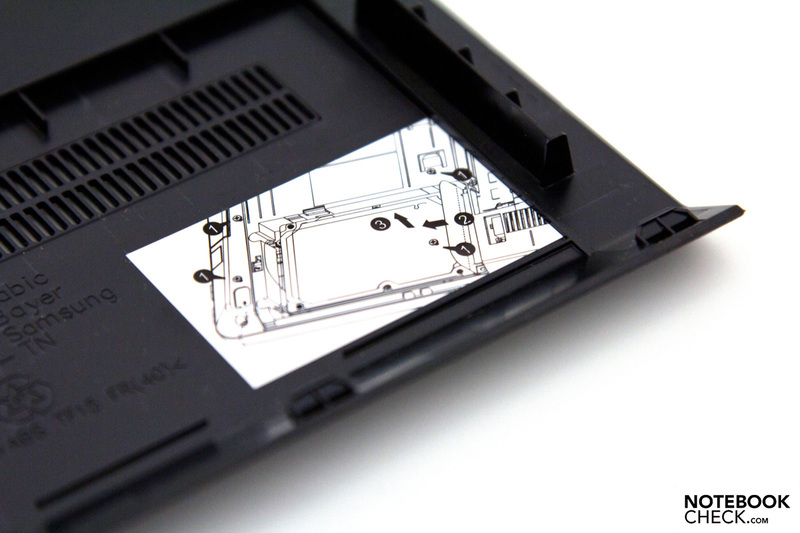 A further area of criticism is the low position of the slot for expansion cards (ExpressCard 34). 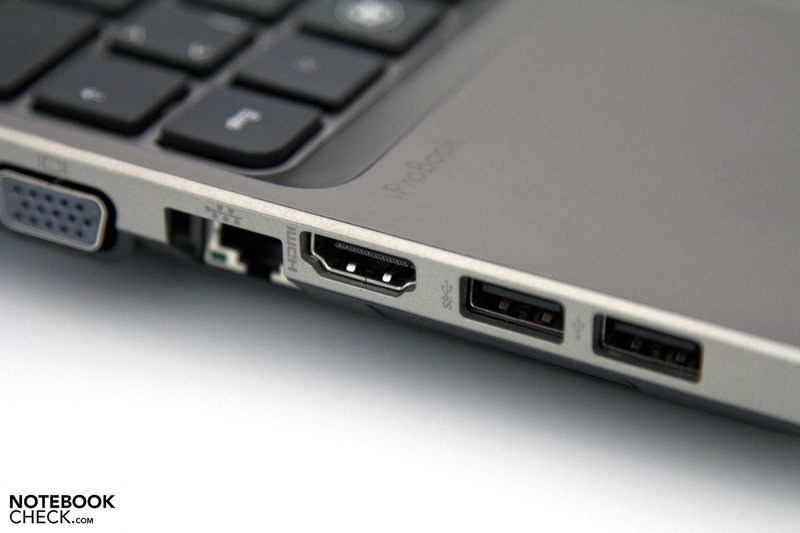 Many such cards block the use of the two USB ports, as well as the HDMI output on the left side of the device. When it comes to communication possibilities no wishes are left unfulfilled, and the current state of technology is provided in all areas. Along with Gigabit Ethernet, there is also WLAN 802.11n, as well as Bluetooth 3.0 +HS available. 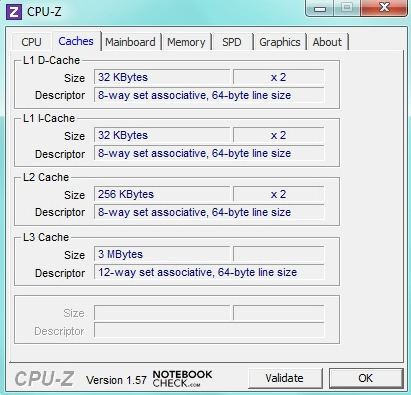 For an additional sum there is also a 3G UMTS module type "HP Ic2010" available for the ProBook 4530s. The necessary space for this is already available, although the necessary socket and aerial are missing, and a retrospective installation is not possible. The delivery has been adapted to saving cost, and only the most necessary things are included. 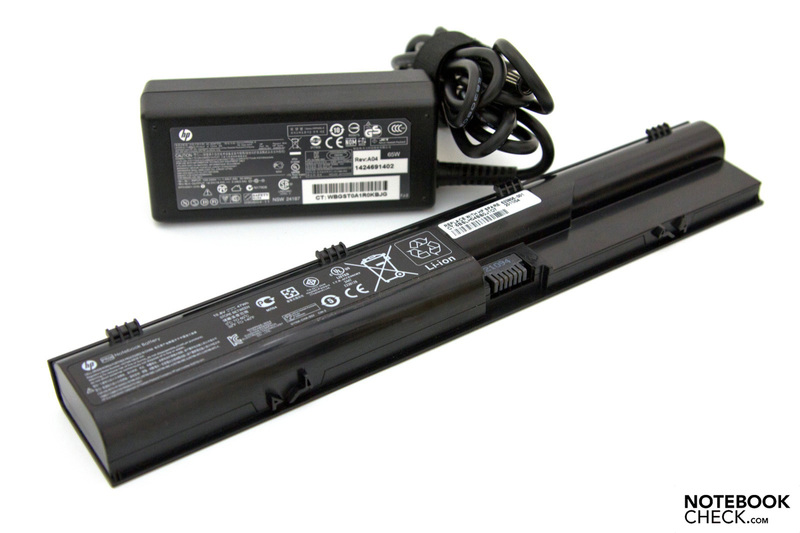 Along with the notebook itself, there is also a 65 Watt AC adapter with a power lead, and a 6 cell battery with 45 Watt-hours, as well as printed documentation. 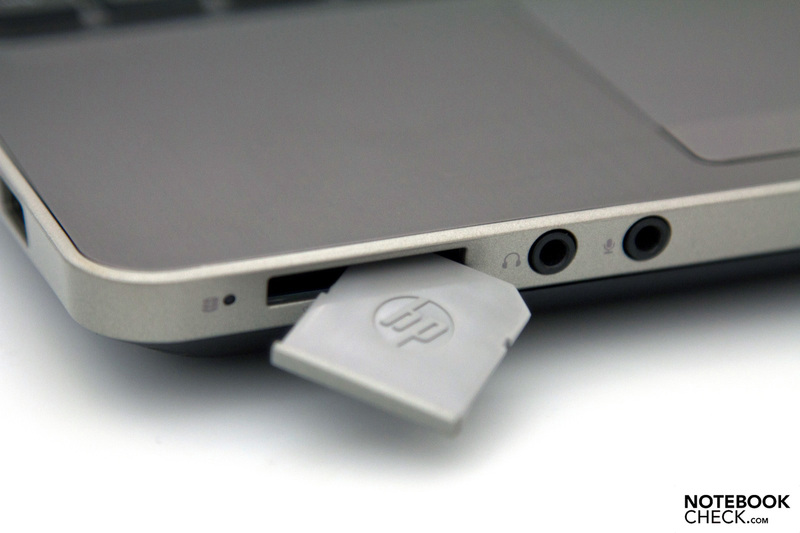 Optionally HP provides several accessories. Among these are for example a bigger battery with 9 cells and 93 Watt-hours, port replicators, bags, and an external drive. Its a similar picture when it comes to the pre-installed software. Along with Microsoft Office 2010 Starter, there are several freeware programs, as well as the usual test versions of an antivirus software included. With a warranty period of only 12 months with Bring-In-Service, the level of service provided is on the weaker side. The more expensive business notebooks from HP in comparison come with 36 months as standard. 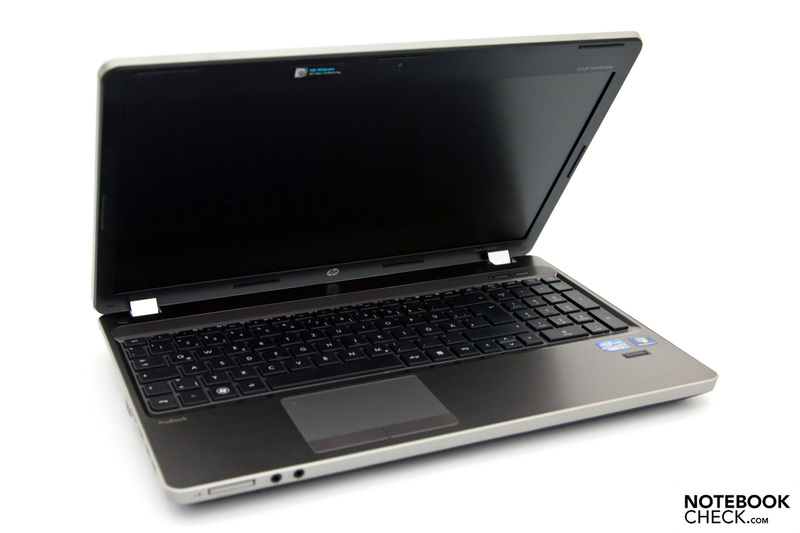 Many consumer notebooks also provide a better package including Pick-Up & Return service. For an additional price the warranty can be extended to a maximum of 60 months. Fittingly with the new design, the keyboard has fortunately also received a refresh. With the same key markings the chiclet style layout makes a very cleaned up and generous impression. Compared to its predecessor with edge-to-edge design, the keyboard is now integrated into the case, but still makes a generous impression. 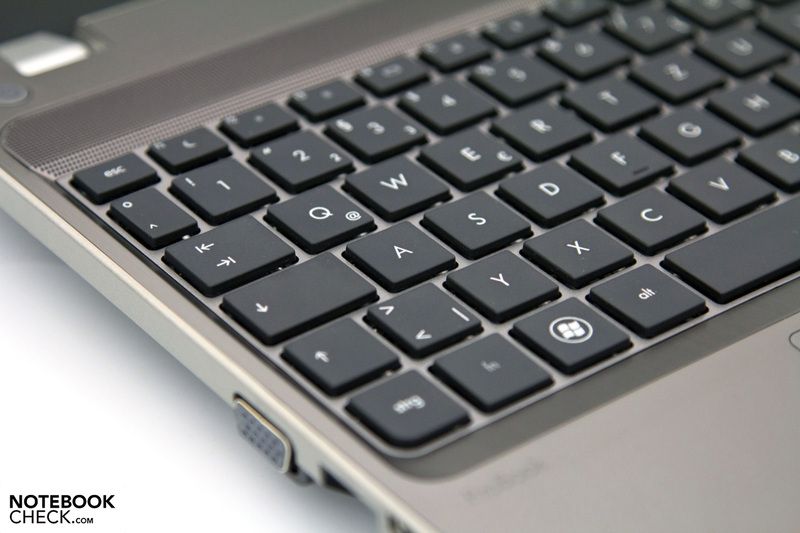 With a key size of 15 x 15 millimeters there is even still enough room for a full alphanumeric keypad, without causing any annoying space saving. Merely the dimensions of the arrow keys were scaled down to a small extent. The keys provide a short travel and a very clear pressure point. Altogether the subjective feeling is good, whereby the firm character of the keys and the resulting slightly juddery typing has to be liked. The very stable supporting surface can be described as a positive characteristic though. The provided Fn functions stand out from the rest of the keys as small symbols. 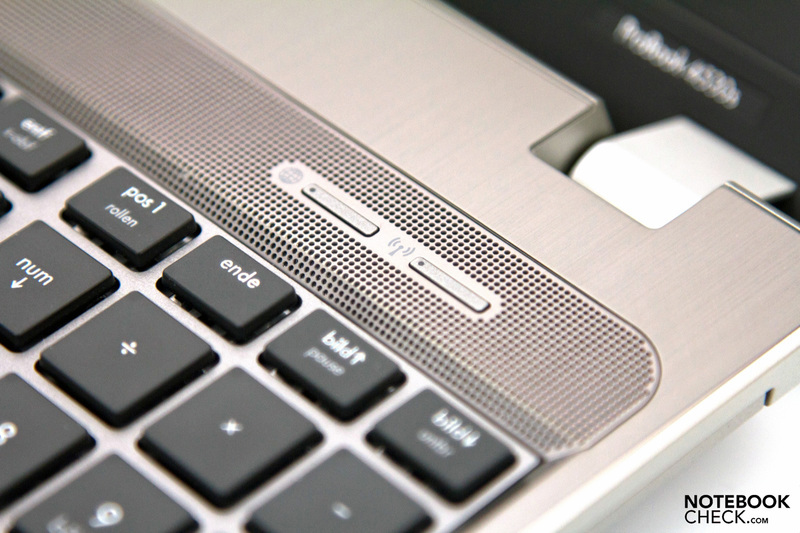 HP has opted not to use additional keys above the keyboard for the most part. There are two small buttons for starting the internet browser as well as the configuration of the mobile technologies, which appear to be useful and fit into the picture well. 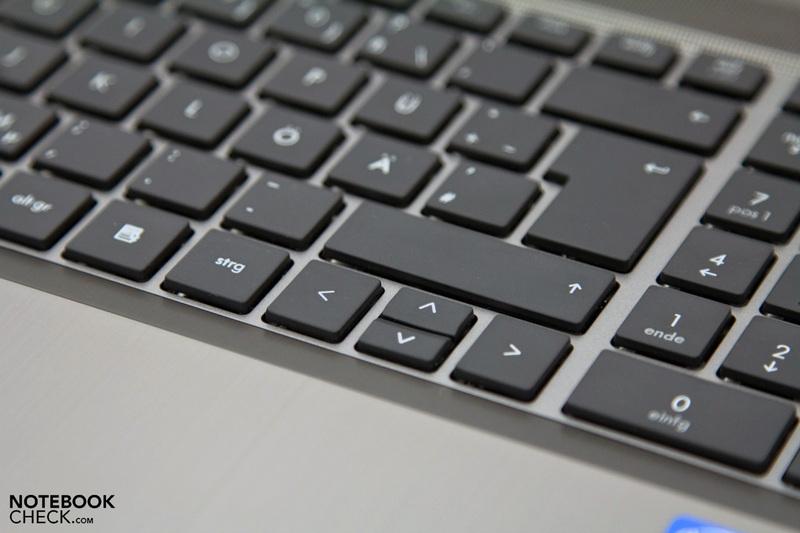 An optional keyboard backlight would also have made a positive impression. 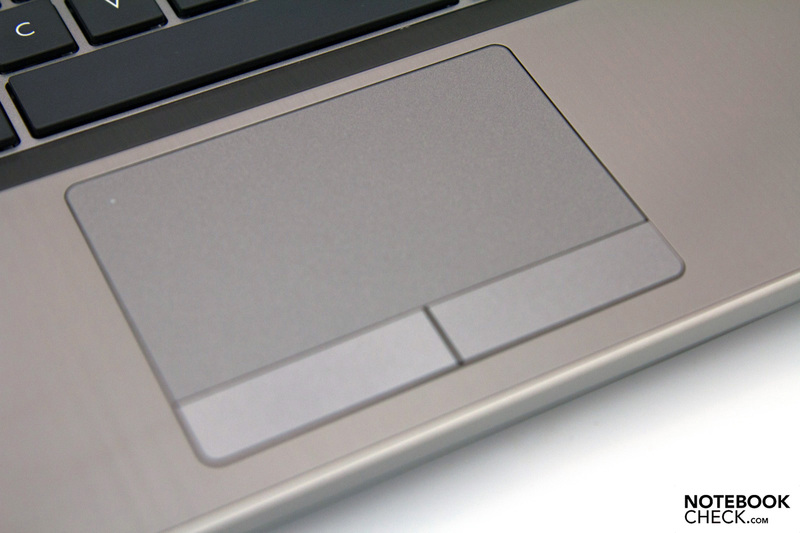 The touchpad has grown with measurements of 93 x 53 millimeters, and provides a usable diagonal area of 10.6 centimeters that has good gliding properties. The device by Synaptics is called LuxPad V7.5 and supports multi-touch gestures. The tried and tested scroll bars at the edges are not available, and cannot be activated by changing the settings. On the other hand working with the gestures is possible without any problems. The mouse replacement buttons have a matching color, and the physical separation is appealing. The clear pressure point, as well as the short travel and the low noise emitted when operating, are all positive aspects. An affordable notebook usually includes a matching display. The mainstream HP ProBook 4530s model tested by us has a 15.6 inch display with the usual 1366 x 768 pixels resolution, and a 16:9 aspect ratio. Along with this there is also a reflective display available (BrightView), whereby the choice shouldn't be too difficult. More interesting is the option for a matte display with a 1600 x 900 pixels resolution (HD+, anti-glare) and WVA (Wide Viewing Angle), which also raises the cost of the notebooks though. Even without this extra, the same resolution and others can be provided from the VGA and HDMI outputs. The picture quality from both of these outputs was able to impress with a resolution of 1920 x 1080 pixels (Full HD, 1080p). 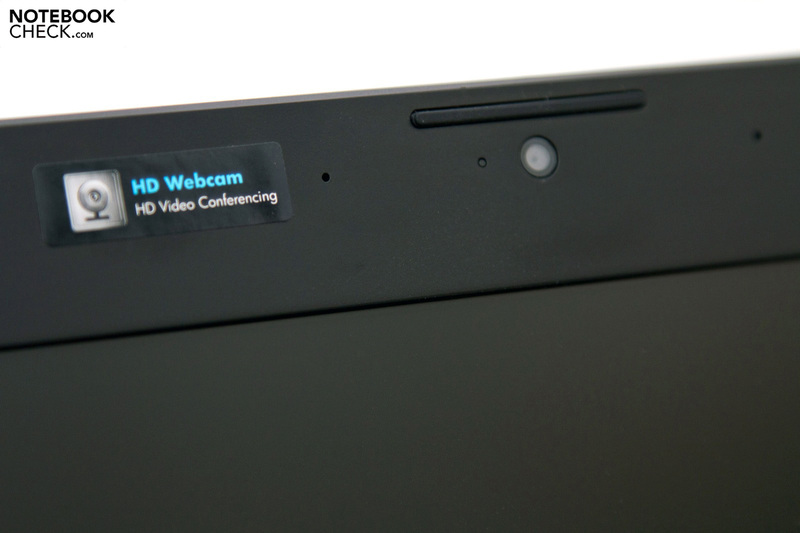 On the subject of quality: HP highlights the 2 Megapixel webcam above the display with a small sticker. With a maximum resolution of 1280 x 720 pixels (720p) the picture quality is able to impress, and a small indicator light shows if the webcam is active. Since a manual privacy cover is missing, this is a neat feature for protecting privacy. The pre-installed software "ArcSoft Webcam Companion" makes several settings possible with a simple user interface. The illumination of the display is provided by small LED's, which leave an average impression following the first measurements. With a maximum of 186 cd/m² the luminance is not exactly overwhelming, but certainly enough for use in closed rooms. Compared to this the illumination distribution can be described as 'good' with a value of 87 percent. The variations are not subjectively visible, and also the clouding as a result of the LED backlighting is not noticeable. The additional measurements from the adopted display made by the Taiwanese manufacturer Chi Mei (type: N156B6-L0A) continue to give average results. The black level is slightly elevated with 1.09 cd/m², which causes a slightly gray impression. Further to this the contrast ratio of 176:1 is within the expected range. The comparable Samsung 200B5B at least has a significantly better luminance. 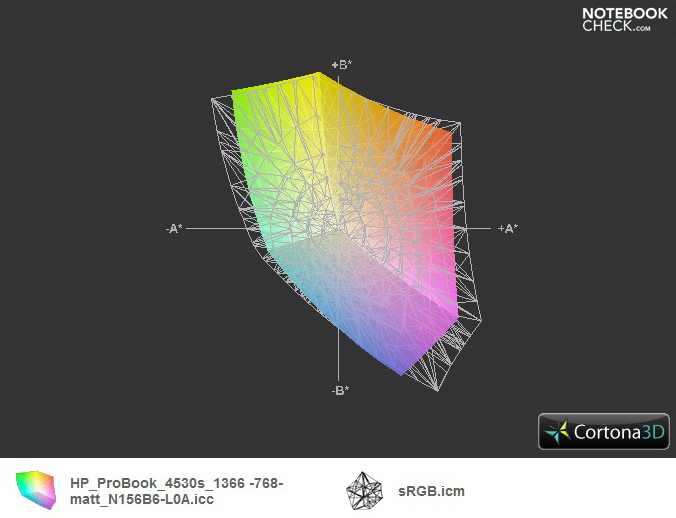 A possible disadvantage of the ProBooks when it comes to professional use is the missing cover of the sRGB color space, which is the basis for many graphics applications. Combined with the not exactly brilliant color representation, compared to reflective displays, this is not an optimal solution, particularly for professional image editing. 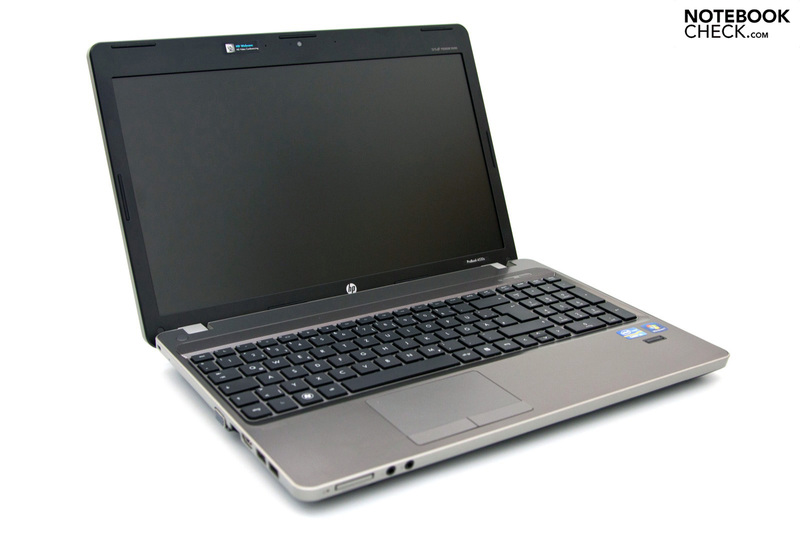 With its matte display surface and the matching frame, the HP ProBook 4530s provides the prerequisites for use outdoors. Assuming there is not an excessive amount of sunlight, then this assertion can be described as accurate, even though the average illumination makes working more difficult under direct sunlight, and a new location could be required. Altogether working isn't much of a problem though, especially since reflective displays are only seldom able to score points in this respect. The viewing angle stability is the final confirmation that we are dealing with an affordable TN display panel. The horizontal viewing angle stays relatively stable up to about 130 degrees, from where a contrast change also takes place. Compared to this a mere deviation of 10 degrees vertically is already enough to cause inversions. The requirement of such precise viewing positions can quickly become annoying with several people. To help with this problem HP also provides the HD+ display with WVA (Wide Viewing Angle) for an additional sum, whereby this is also not an IPS panel. So far this privilege remains the reserve of more expensive business notebooks from HP. 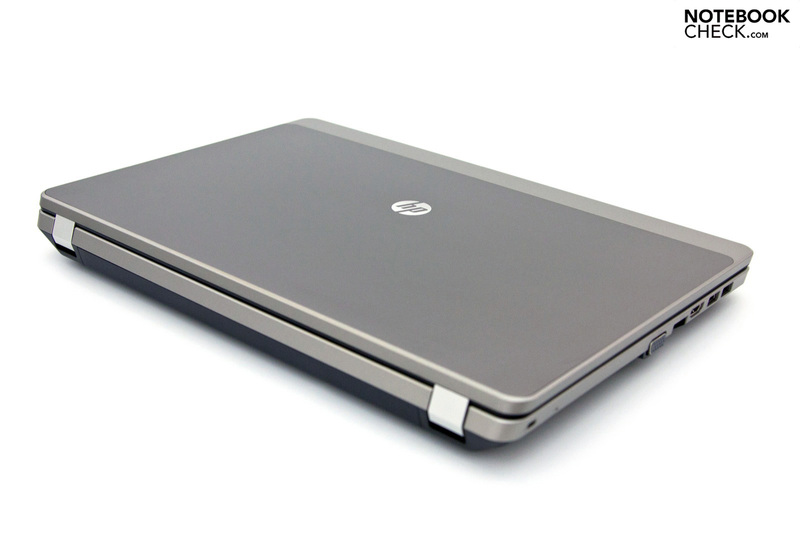 One example of this is the HP EliteBook 8740w mobile workstation with the so called Dreamcolor display. 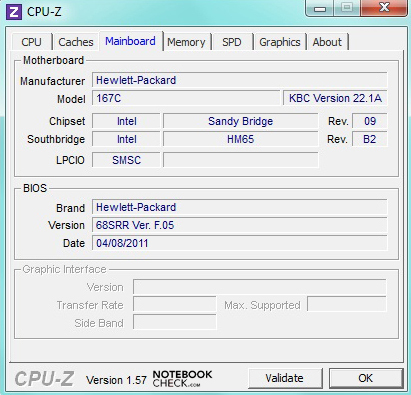 On the basis of the current Intel Huron River platform with HM65 chipset, HP offers a number of different components for the ProBook 4530s. 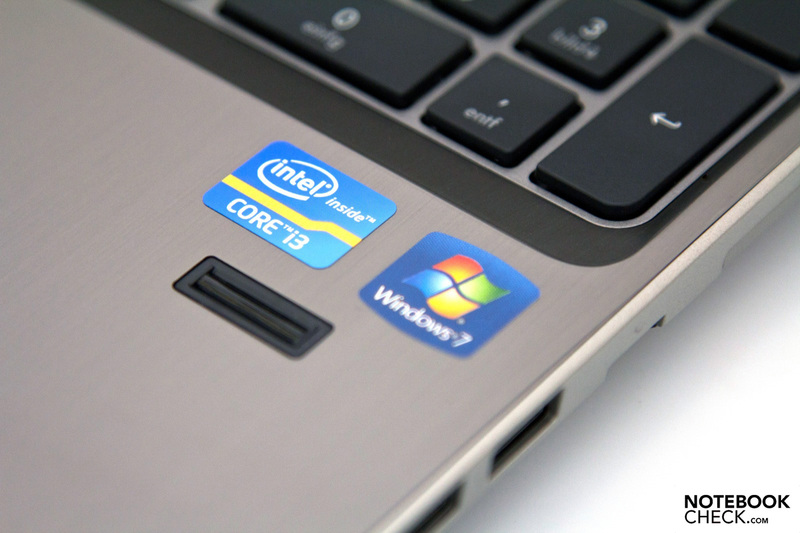 In our case the entry level dual-core processor Intel Core i3-2310M with a clock speed of 2.10 GHz has been adopted. The solution doesn't provide support for Turbo-Boost or AES News Instructions (en- and decryption), but does support the Hyper-Threading technology (2 cores, 4 threads). The additional portfolio also includes diverse dual-core processors. Among these is Intel's Core i5-2410M, or the dual-core top of the range Intel Core i7-2620M with a clock speed of 2.70 GHz. 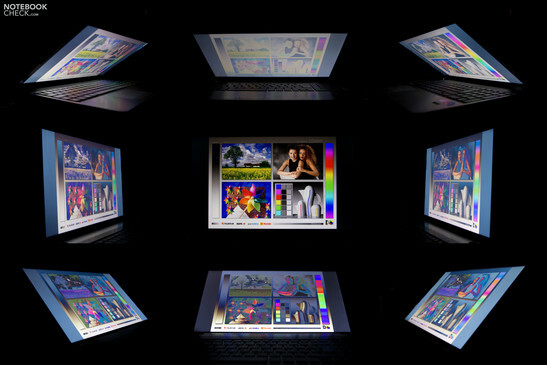 Matching with the concept of the notebook a dedicated graphics card has been omitted, and the integrated Intel GMA HD 3000 GPU is used instead. 3D gaming enthusiasts will unlikely find this very useful. The additional hardware components of the model XX968EA include 4 GBytes of DDR3-10600S RAM (1x 4096 MByte), whereby this can be increased to up to 8 GBytes (DDR3 SODIMM) thanks to a free socket. The storage medium is a 2.5 inch hard drive made by Hitachi that has a capacity of 320 GBytes (HTS723232A7A364), and a rotational speed of 7200 rpm. We started our series of benchmark tests with the CPU benchmark CineBench R10. 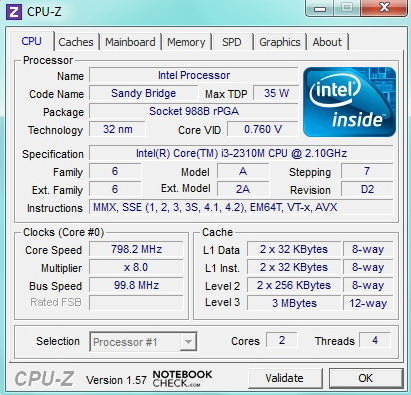 In the single-thread rendering (64-bit) benchmark the ProBook managed to score 3496 points with its Intel i3-2310M CPU, which is a lower mid-range result. The Intel Core i5-2410M (2.3 GHz, Turbo-Boost) and Intel Core i7-2620M (2.7 GHz, Turbo-Boost) processors that are also available, managed to score a decisively better 4488 and 5245 points respectively. The performance difference to the alternatives lies at +22.1 and +33.4 percent. In light of the additional cost and the already available configurations, the Intel Core i5-2410M is the most efficient solution for the mainstream model. Working with parallel running applications and different windows is part of daily use these days, and the multi-thread calculation (64-bit) benchmark from CineBench R10 assesses precisely this performance. 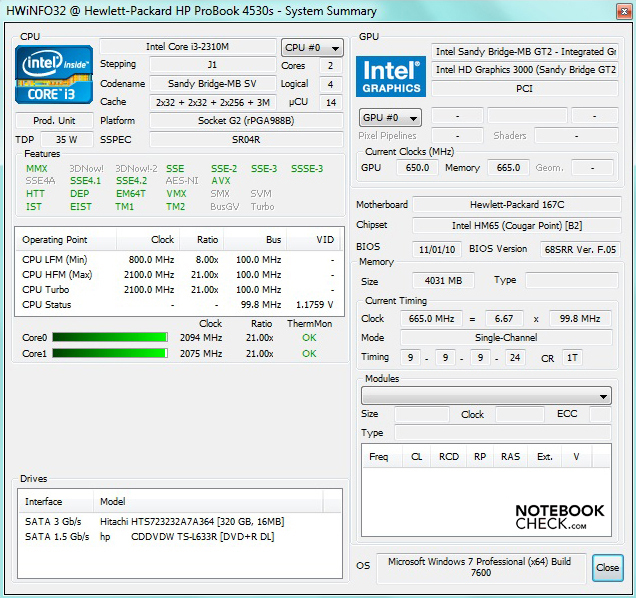 With a result of 7423 points the Intel Core i3-2310M is in the mid-range as expected. The difference compared to the aforementioned processors is almost identical, and is also confirmed by the more up to date CineBench R11.5 benchmark. This fact and the low additional cost of 30 Euros, confirms our recommendation for the faster Intel Core i5-2410M. 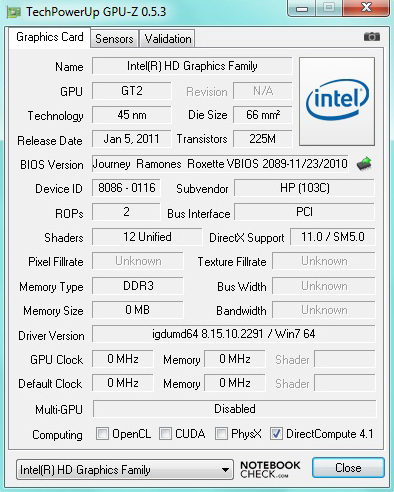 The 3D performance is not the best feature of the Intel HD Graphics 3000. The synthetic gaming benchmark 3DMark06 from Futuremark confirms this with a result of 3087 points, which nudges into the bottom third of our test database. On a comparable level are the AMD Radeon HD 5470 or Nvidia's GeForce GT 310M entry level GPU. For more performance in this area we would recommend a system with a dedicated graphics card. One example would be the wide portfolio of the Nvidia GeForce GT 500 series with the popular and aimed at multimedia applications GT 540M. Buyers will have the opportunity to find a suitable device in personal reviews and buy recommendations. The system benchmarks from Futuremark assess the whole performance provided from the components, and make a verdict possible. The PCMark Vantage benchmark ascertained a result of 5200 points. This places the 4530s in the balanced mid-range, and is partially outperformed by some older configurations with an Intel Core i3-350M or i5-450M though. These variations are partially a result of individual components, whereby the differences in performance compared to systems with an identical CPU can also be explained. A similar result is provided by the newer PCMark 7 with a score of 1921 points. Altogether a good office performance that doesn't stand out from the mass of notebooks. 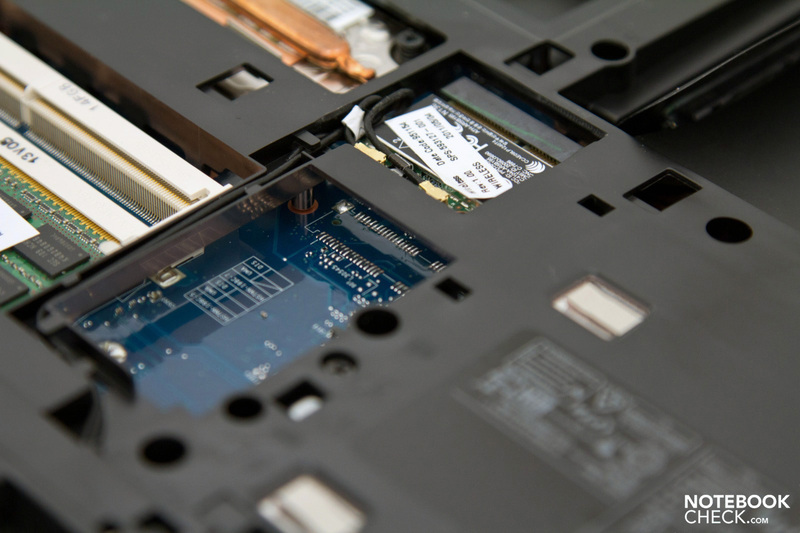 Common hard drives are a guarantee for affordable storage capacity, with which the performance isn't a particularly positive aspect. 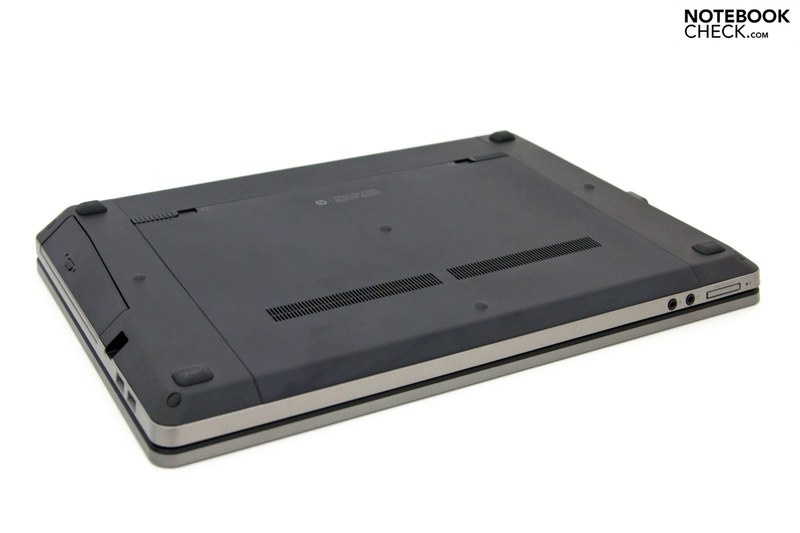 With a rotational speed of 7200 revolutions per minute, and connectivity via SATA II, the HTS723232A7A364 made by Hitachi places itself in the upper segment. The CrystalDiskMark benchmark confirms this with a maximum read transfer rate of 92.39 MB/s. 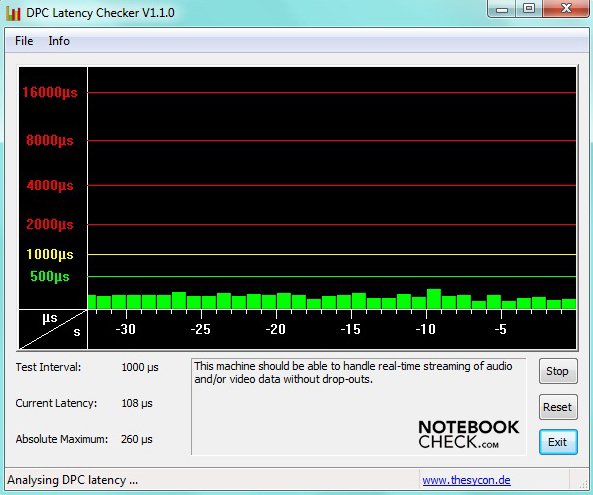 A noticeable system bottleneck are the elevated access times, which can be determined by HD Tune and AS SSD. 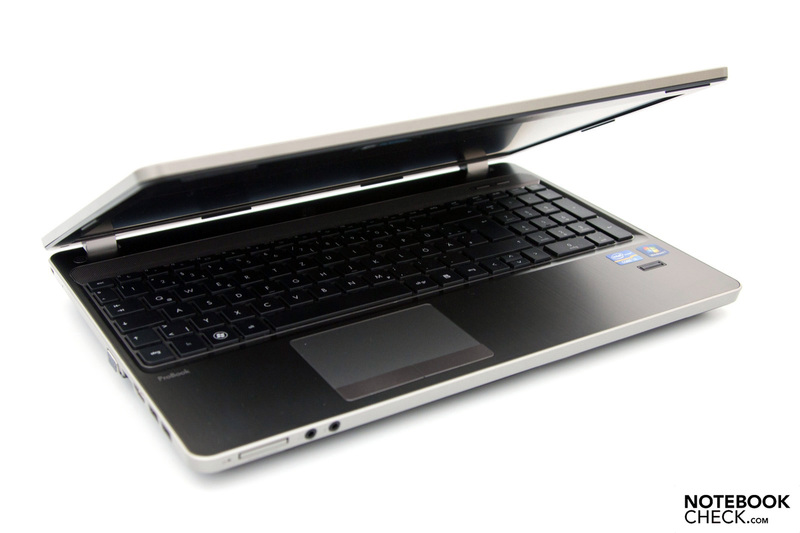 Depending on the model, the ProBook is also available with more or less storage capacity, as well as slower hard drives. 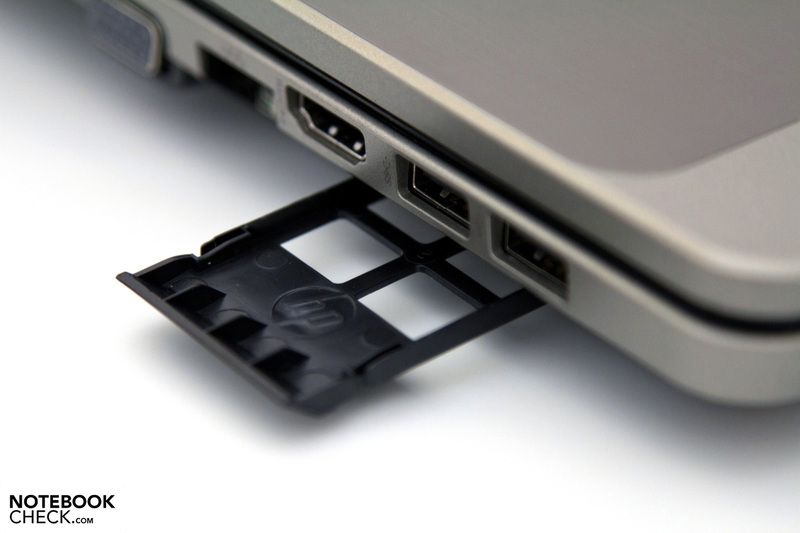 Modern hybrid drives or pure Solid State Drives are not provided by HP themselves, and have to be acquired retrospectively according to the requirements. 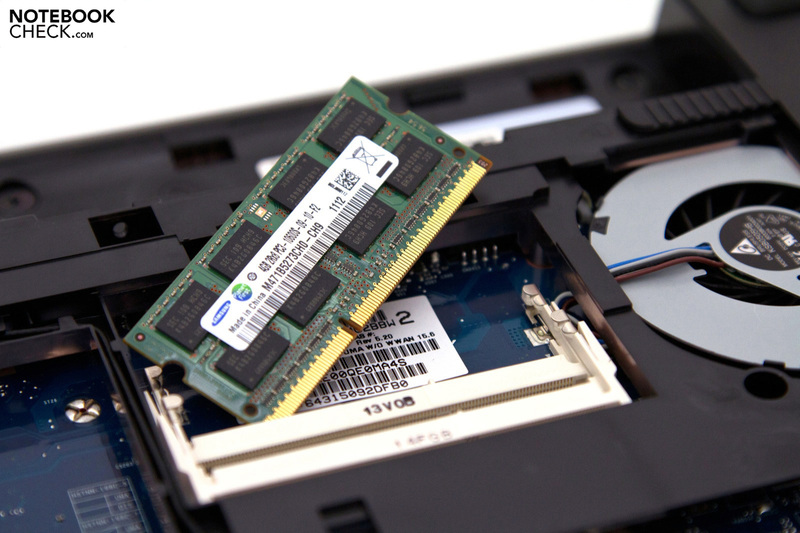 Thanks to an up to date platform, SATA III is also supported providing for transfer rates of 6 Gbit/s, whereby Intel's SSD Series 510 or the OCZ Vertex 3 could be used for example. We expect the appropriate system noise from a modern portable typewriter for use in the library. The cooling system isn't able to live up to these expectations with a permanently rotating fan, which doesn't even stop in an idle state. In quiet surroundings the device can be heard with a maximum of 34.9 dB(A). 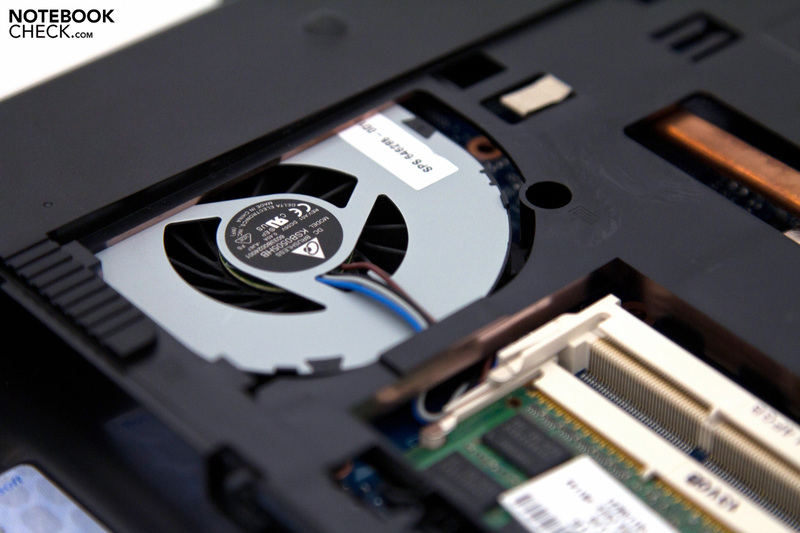 At the same time the cooling fan also trumps the surprisingly quiet hard drive. Under load we were able to measure a clearly audible maximum level of 41.1 dB(A) at a distance of 15 centimeters. A positive example in this respect would also be the previously tested Samsung 200B5B notebook with a similar configuration. 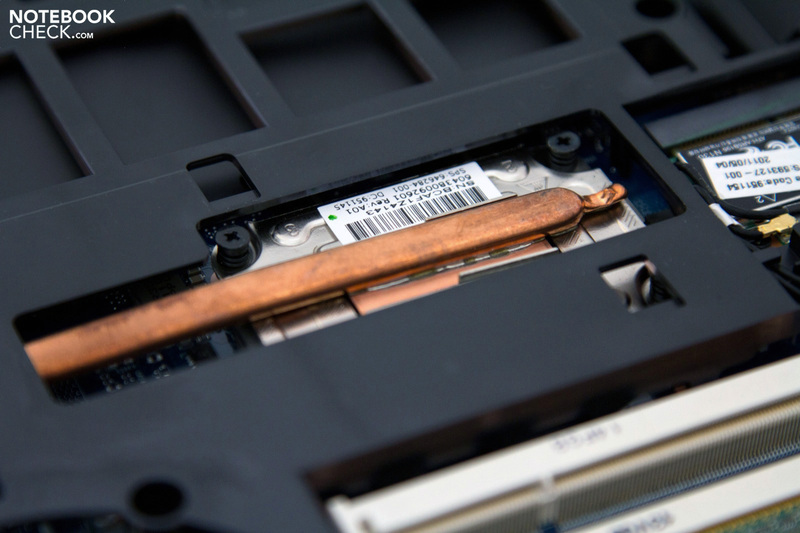 It may not be quiet, but instead the tested device stays cool in an idle state. 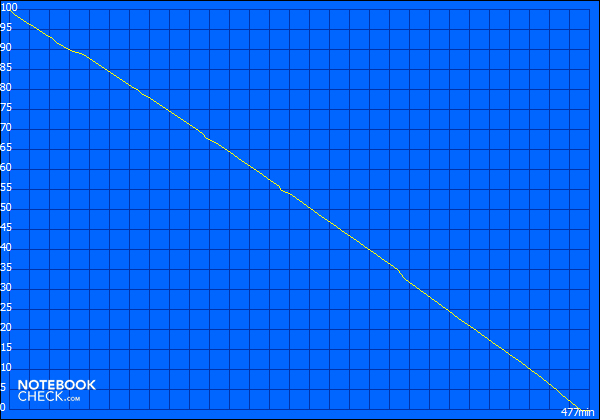 With a maximum of 29.3 degrees Celsius on the bottom, the temperatures stay within a good range, depicted by blue in our diagram. 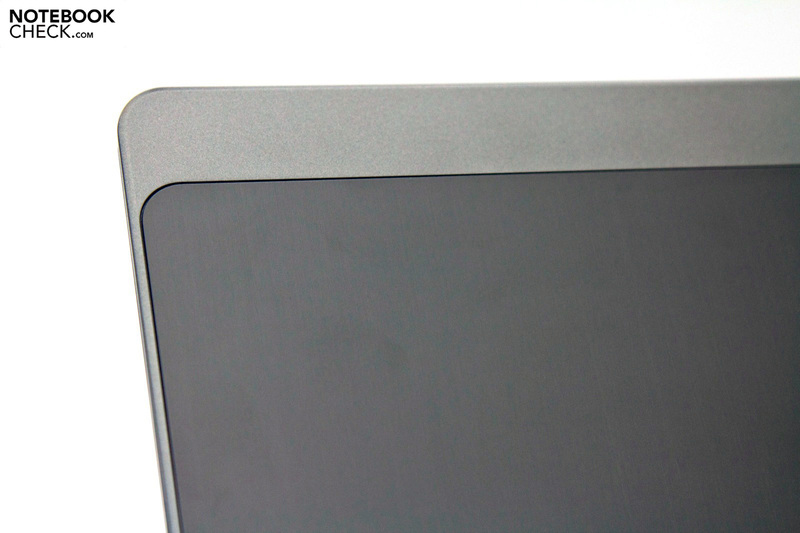 Subjectively the plastic surfaces stay lukewarm, whereby the aluminum parts are slightly cooler. 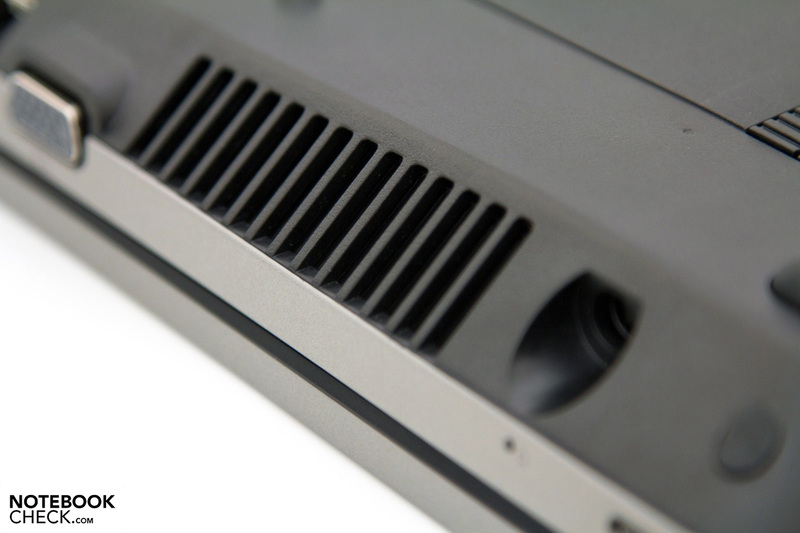 Under load the heat dissipation and thus also the temperatures of the case rise. The area around the peak value of 37.8 degrees Celsius can clearly be felt, and prolonged use on the legs could, but doesn't necessarily, get uncomfortable. The inside area around the keyboard in comparison stays relatively cool, and the ergonomics are not impaired in this scenario. 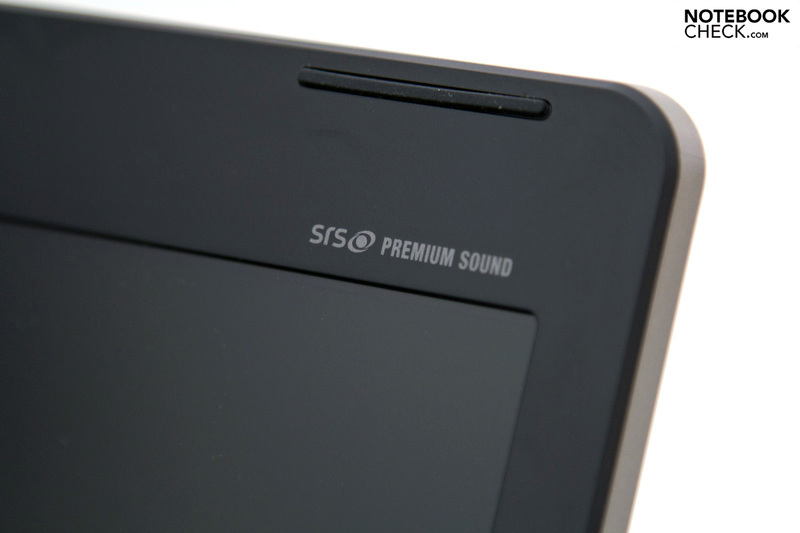 Printed text above the display reading "SRS Premium Sound", managed to raise our expectations. After the first few songs from a variety of genres the high expectations weren't met however. The playback of high frequencies is clear, and the maximum volume is more than sufficient, but the missing bass frequencies and a rather half hearted lower frequency range make the audio experience less enjoyable. In comparison we would place the tested device in the mid-range, whereby there are sizable differences above and below. External loudspeakers or headphones can be connected via the usual 3.5 mm stereo jack, or via the HDMI output. Both ports provide for a perfect transfer of audio, whereby the final quality ultimately depends on the receiving device. A good battery life can be a decisive criteria for buyers. 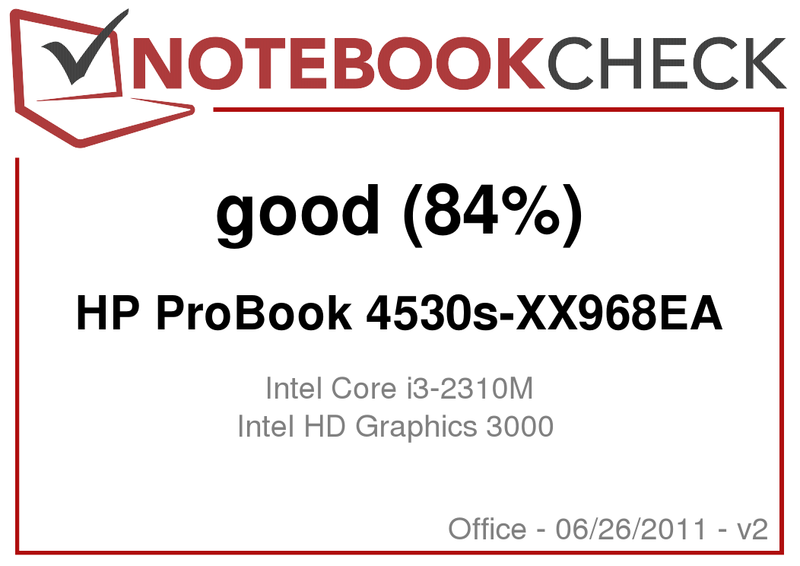 Thanks to the new hardware and the omission of a dedicated graphics card, the HP ProBook 4530s should also be able to score points in this area. The tool Battery Eater offers a diverse set of measurement scenarios with different presets. The Classic test assesses the minimum battery life when the hardware is fully utilized, with active WLAN and the maximum display brightness. After only a short 80 minutes a complete battery charge was used up. The opposite of this is provided by the Reader's test, which tests the scenario of reading a text document with WLAN deactivated and the minimum display brightness. Thanks to the automatic Energy Saver function (CPU speed: 800 MHz), a maximum battery life is achieved that is decisively different from the previous measurement. If a practical average value is to be determined, the measurement "surfing via WLAN" is available with a pleasant display brightness. After 4 hours and 53 minutes this test was also finished. Altogether this provides for an acceptable battery life with the included 6 cell battery (47 Watt-hours), which can be more or less doubled with an additional 9 cell battery (93 Watt-hours). This extra may not currently be in the list of accessories, but it is unlikely to be cheap. 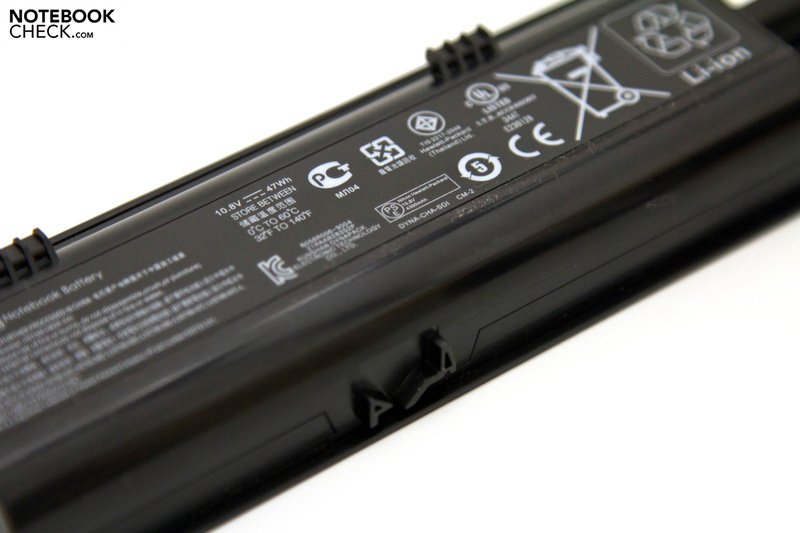 The included battery type HP PR06 already costs 119 Euros (RRP) from retailers. 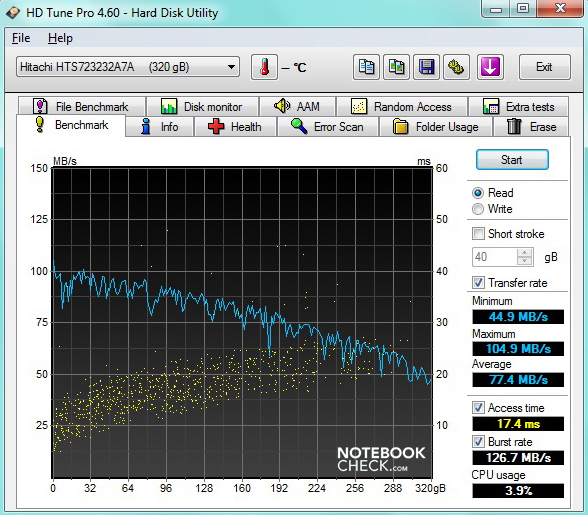 A glance at the power consumption values for the notebook confirm the battery life. In an idle state the maximum power consumption of 12.6 Watts remains within limits. 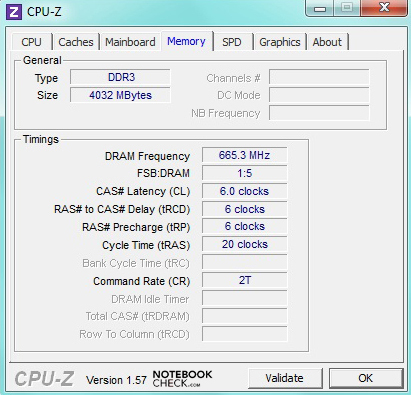 With a peak power consumption of 51.2 Watts under load things already start to look a bit different though. The power consumption in standby, and in a switched off state, stays within the usual range between 0.5 and 0.3 Watts respectively. The 65 Watt AC adapter included with the delivery provides sufficient performance, and doesn't have any problems with the notebooks power requirements. 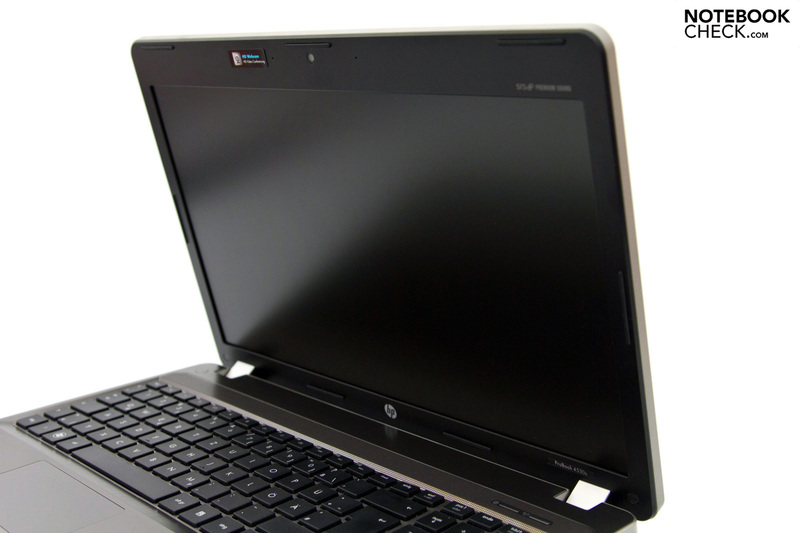 The HP ProBook 4530s office notebook leaves an altogether good overall impression. The numerous configurations, as well as the impressive case refresh, and the good stability, are only some of the positive aspects in this respect. Also the easy upgrade possibilities, as well as the selection of interfaces, and the input devices, are additions to the included advantages. In comparison to these what's missing is a longer warranty period as standard, as well as a standard display with better characteristics. The matte surface, and the option of a higher resolution alternative with better viewing angle stability, have to be praised though. The combination of Intel's Core i3-2310M, and the integrated GMA HD 3000 graphics card, is more than enough for all office and many multimedia applications, especially since the performance advantage as well as the efficiency are better compared to the previous generation. When considering the possible configurations we would recommend choosing the model with the more powerful Intel Core i5-2410M despite of this, since this supports the Turbo-Boost technology, and is provided at an affordable price for an additional 30 Euros. Along with an acceptable battery life with the included 6 cell battery, merely the constantly running cooling fan has a negative impact. Altogether the tested device represents a successful update to the series, with big advantages, and a few disadvantages, which should be taken into consideration. With a price of between 700 and 800 Euros, the HP ProBook 4530s mingles among the usual price range for these types of devices, but is nevertheless a not bad choice for the next office notebook acquisition. 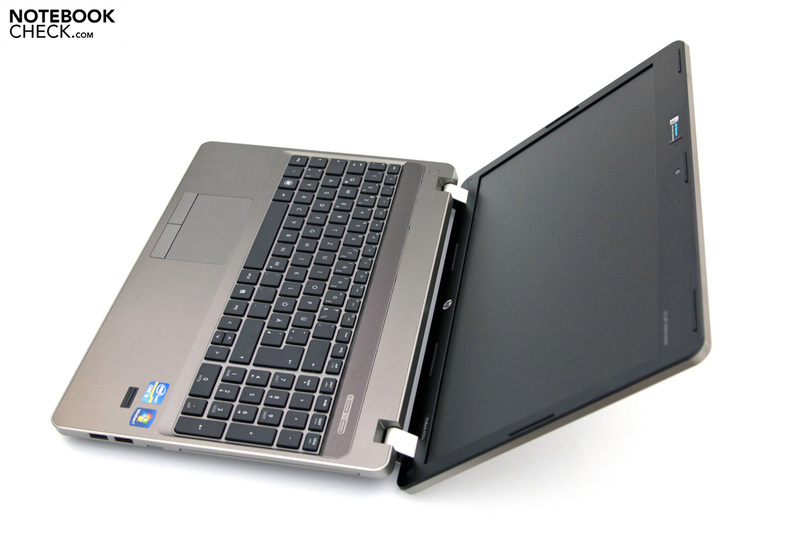 The new design of the 2011 ProBook series, as well as the case stability, and the numerous configuration options. A standard 24 month warranty with Pick-Up & Return service, as well as a better display as standard. The successful all-round impression, combined with the comparatively low entry price. 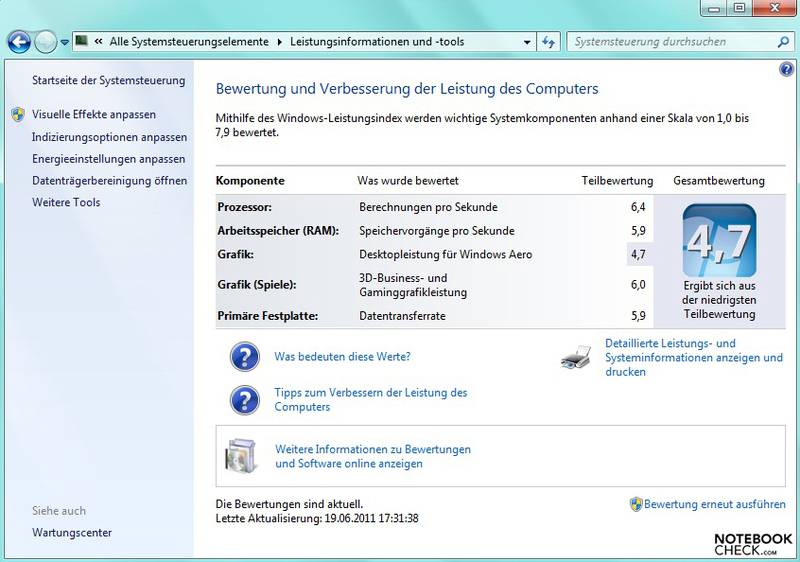 Also the affordable upgrade for a more powerful Intel Core i5-2410M is a positive aspect. Affordable office notebooks with a 15.6 inch display and up-to-date hardware. Among these are for example the new and comparable Samsung 200B5B-S01DE, the more expensive HP EliteBook 8560p, Lenovo's ThinkPad L520, or the Dell Latitude E6520 entry model or the Latitude E6520 with an Intel Core i7 CPU.